Mindsilt: Don't Mess with Texas Football? Too Late. For those of you who don’t follow college football, there is a big hoohah going on right now over Texas A&M. They want to leave their current conference, The Big 12, to join the SEC. Basically, they’re pissed that Texas (the University of) got their own TV network so they want to take their ball and go to someone else’s home. There’s a good chance that Texas A&M’s exit from the Big 12 may mean the end of the conference because the other top teams may look for other conferences to join as well. 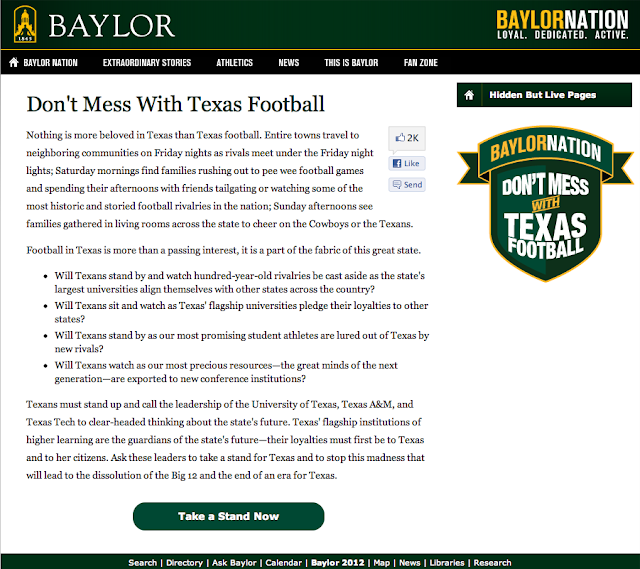 Anyway, Baylor — who is one of the traditionally worst football teams in the conference — has created an unintentionally hilarious website in reaction to this whole thing. My favorite part is the bullet points. They all begin with “Will Texans…” Will they “stand by,” will they “sit and watch?” Yes, they will do exactly that. Why? Because these universities will do whatever the hell they want, and because your little “Take a Stand Now” link goes to a page that tells them to write to the presidents of the other Texas schools. This is the Internet, people don’t want to have to click more than twice to do anything. Nice try. You’d do better to set up a search and grab all of the angry tweets. These Texas schools (Texas A&M, Texas, Texas Tech) are already aligned with other states across the country. They are in the Big 12 with Iowa State, Kansas, Kansas State, Missouri, Oklahoma and Oklahoma State. Last time I checked Iowa, Kansas, Missouri and Oklahoma are still states. States that Texas’ flagship universities have aligned themselves with. As opposed to your old rivals who have large numbers of Texans on their rosters? Like Oklahoma with 58 Texans or Oklahoma St. With 67 Texans or Missouri and Kansas with 37 Texans or Iowa St. with 23 Texans or Kansas St. With 18 Texans? But it’s the devil you know, isn’t it Baylor? Do you include Vince Young as one of the “great minds” who is one of Texas’ “most precious resources?” Are you really calling your football players the “great minds of the next generation?” I’m sure some of them are but only if they immediately stop killing brain cells by smashing into one another. Don’t mess with Texas football? When Baylor is waving that flag, Texas football is already screwed. Also, Texas, get over yourself.